Things have been a but quieter around the blog than I would have wanted, but with work and travel taking up most of my time, I haven’t really had time to smoke that many cigars or write up much. Having said that, there are a few reviews lined up for the blog and these will come up soon. Today I am going back to Connecticut shade wrapper cigars. A while back I mentioned I started to look at these lighter smokes with more attention after I was really impressed by one brand among them. Today I am looking at that very cigar, the Oliva Connecticut Reserve Robusto. Oliva needs little introduction. In very few years this has become a major brand on the cigar market and recognised for its quality and consistency. Still, until recently it certainly was not a brand known for making mild cigars. The O and G line, and especially the V line are better known for their rich flavours, and in the latter, their full body. Just under a year ago Oliva decided to launch the Connecticut Reserve which covers the missing space body-wise in their range. Price: 4-5$ for a single and boxes of 20 go for around 90$ in the US. In Germany singles are available for around 5-6€. 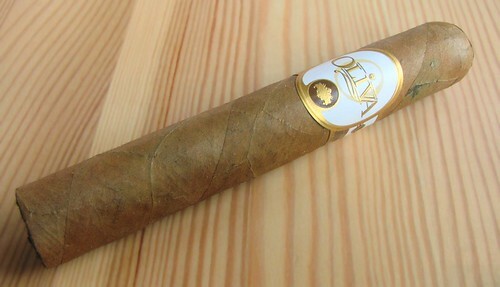 Although Oliva cigars are available in the UK, the Connecticut Reserve doesn’t seem to have reached these shores yet. The cold smell, both on the wrapper and the pre-light draw was mainly tobacco, not much more. The first few puffs are mainly mild tobacco, but quite quickly these evolve to more interesting notes of Nicaraguan spice and rich toasted, almost biscuity, notes. Not terribly complex but extremely clean and smooth flavours. The evolution is a lot more gradual then what you experience with more complex smokes, but it definitely is there. While the spice slows down a bit, there are nice nutty, toasted and salty notes (reminding me of salted toasted almonds). The body picks up quite a bit, going definitely into medium territory by the halfway point onwards. The finish remains clean and smooth as before, but again the taste chance. The cigar is woody, with just a hint of the nuts noticed before, and the Nicaraguan spice makes way for pepper and subtle vanilla notes. It goes slightly hot only below the last 3/4″, which is nice. Having said right at the start that I am really impressed with this cigar, it is no surprise that I really like this Oliva Connecticut Reserve. While it isn’t the most complex of smokes, it is smooth, with nice flavours and a body that makes this interested even for experienced smokers who would normally shun mild smokes. Add to this great construction and a great price and you have a winner. I scored the three cigars I had between 90 and 91. Having tried the Toro of this same range, I have to say that for me the Robusto is more interesting; given the slow evolution and simple flavours, I found the Toro didn’t keep me interested until the end. But that’s just a personal thing. If you don’t mind a constant flavour profile you might like the longer smokes of the Connecticut Reserve range. On a side note, I found that taste-wise, this had a few common traits with the NUb Connecticut. A bit more coffee on the NUb but the spice is very similar. Not that this is too surprising given that both are made by Oliva. This entry was posted in Cigar Reviews, Connecticut shade, Nicaraguan and tagged Cigar Review, Connecticut shade, Nicaraguan cigars, Oliva, Robusto. Bookmark the permalink. Greetings! I’ve smoked both the Robusto and the Toro and have to say I was impressed the first time I tried the Oliva! As someone who generally smokes CC’s, this is one of the few domestic brands I would recommend and keep stocked in my humidor!